This DC-UPS contains a 5 amp-hour sealed lead acid battery. It is charged from the vehicle's electrical system and switches your load to its internal battery when the engine is turned off, or at any other time that the electrical bus drops below 11.8 volts. Useful for emergency vehicles, police cars, fire equipment, agricultural equipment, taxi's, van's, boats, stationary generators and other 12 volt systems. The Backup-Mobile UPS is designed to keep your equipment from losing power or rebooting during engine startup, ensuring these spikes and sags in power don't shorten the life of your mission critical electronics. We do this by providing uninterrupted, clean, consistent power to your equipment, extending the life of your electronics up to 2 to 3 more years. 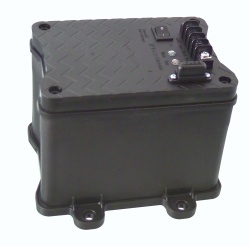 The system prevents your equipment from running the vehicle's battery downavoiding jump-starts. It switches over to the auxiliary battery when the engine is shut off and the alternator stops or the car's battery drops below 11.8 volts. This means you never have to worry about that after-market equipment leaving you with a dead battery in the morning. The PowerStream Backup-Mobile UPS isolates its battery from the vehicle, so it can't be discharged by the vehicle's other electronics, and it won't try to participate in the engine startup process. The DC-UPS powers your equipment in the vehicle using the car electrical system, but switches to external battery power when the car's battery is removed, stolen, or drops below a predetermined voltage, acting as a battery backup (BBU) and power conditioner. Allows for safely charging our internal battery from the car's electrical bus by isolating and current regulating the connection to the auxiliary battery. Which means you will also get years of faithful service from your Backup-Mobile UPS. This uninterruptible power supply is designed to withstand the harsh electrical and temperature requirements of automotive equipment including spike, dropouts, load dumps, jump-starting, high and low temperatures.